Not to be confused with Natural language programming. Literate programming is a programming paradigm introduced by Donald Knuth in which a program is given as an explanation of the program logic in a natural language, such as English, interspersed with snippets of macros and traditional source code, from which a compilable source code can be generated. 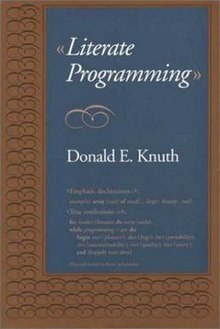 The literate programming paradigm, as conceived by Knuth, represents a move away from writing programs in the manner and order imposed by the computer, and instead enables programmers to develop programs in the order demanded by the logic and flow of their thoughts. Literate programs are written as an uninterrupted exposition of logic in an ordinary human language, much like the text of an essay, in which macros are included to hide abstractions and traditional source code. Literate programming (LP) tools are used to obtain two representations from a literate source file: one suitable for further compilation or execution by a computer, the "tangled" code, and another for viewing as formatted documentation, which is said to be "woven" from the literate source. While the first generation of literate programming tools were computer language-specific, the later ones are language-agnostic and exist above the programming languages. Literate programming was first introduced by Donald E. Knuth in 1984. The main intention behind this approach was to treat a program as literature understandable to human beings. This approach was implemented at Stanford University as a part of research on algorithms and digital typography. This implementation was called "WEB" by Donald Knuth since he believed that it was one of the few three-letter words of English that hadn't already been applied to computing. [clarification needed] However, it correctly resembles the complicated nature of software delicately pieced together from simple materials. Literate programming is writing out the program logic in a human language with included (separated by a primitive markup) code snippets and macros. Macros in a literate source file are simply title-like or explanatory phrases in a human language that describe human abstractions created while solving the programming problem, and hiding chunks of code or lower-level macros. These macros are similar to the algorithms in pseudocode typically used in teaching computer science. These arbitrary explanatory phrases become precise new operators, created on the fly by the programmer, forming a meta-language on top of the underlying programming language. A preprocessor is used to substitute arbitrary hierarchies, or rather "interconnected 'webs' of macros", to produce the compilable source code with one command ("tangle"), and documentation with another ("weave"). The preprocessor also provides an ability to write out the content of the macros and to add to already created macros in any place in the text of the literate program source file, thereby disposing of the need to keep in mind the restrictions imposed by traditional programming languages or to interrupt the flow of thought. According to Knuth, literate programming provides higher-quality programs, since it forces programmers to explicitly state the thoughts behind the program, making poorly thought-out design decisions more obvious. Knuth also claims that literate programming provides a first-rate documentation system, which is not an add-on, but is grown naturally in the process of exposition of one's thoughts during a program's creation. The resulting documentation allows the author to restart his own thought processes at any later time, and allows other programmers to understand the construction of the program more easily. This differs from traditional documentation, in which a programmer is presented with source code that follows a compiler-imposed order, and must decipher the thought process behind the program from the code and its associated comments. The meta-language capabilities of literate programming are also claimed to facilitate thinking, giving a higher "bird's eye view" of the code and increasing the number of concepts the mind can successfully retain and process. Applicability of the concept to programming on a large scale, that of commercial-grade programs, is proven by an edition of TeX code as a literate program. Knuth also claims that Literate Programming can lead to easy porting of software to multiple environments, and even cites the implementation of TeX as an example. Literate programming is very often misunderstood to refer only to formatted documentation produced from a common file with both source code and comments – which is properly called documentation generation – or to voluminous commentaries included with code. This is the converse of literate programming: well-documented code or documentation extracted from code follows the structure of the code, with documentation embedded in the code; while in literate programming, code is embedded in documentation, with the code following the structure of the documentation. This misconception has led to claims that comment-extraction tools, such as the Perl Plain Old Documentation or Java Javadoc systems, are "literate programming tools". However, because these tools do not implement the "web of abstract concepts" hiding behind the system of natural-language macros, or provide an ability to change the order of the source code from a machine-imposed sequence to one convenient to the human mind, they cannot properly be called literate programming tools in the sense intended by Knuth. Weaving: Generating comprehensive document about program and its maintenance. Weaving and tangling are done on the same source so that they are consistent with each other. A classic example of literate programming is the literate implementation of the standard Unix wc word counting program. Knuth presented a CWEB version of this example in Chapter 12 of his Literate Programming book. The same example was later rewritten for the noweb literate programming tool. This example provides a good illustration of the basic elements of literate programming. The following snippet of the wc literate program shows how arbitrary descriptive phrases in a natural language are used in a literate program to create macros, which act as new "operators" in the literate programming language, and hide chunks of code or other macros. The mark-up notation consists of double angle brackets ("<<...>>") that indicate macros, the "@" symbol which indicates the end of the code section in a noweb file. The "<<*>>" symbol stands for the "root", topmost node the literate programming tool will start expanding the web of macros from. Actually, writing out the expanded source code can be done from any section or subsection (i.e. a piece of code designated as "<<name of the chunk>>=", with the equal sign), so one literate program file can contain several files with machine source code. The unraveling of the chunks can be done in any place in the literate program text file, not necessarily in the order they are sequenced in the enclosing chunk, but as is demanded by the logic reflected in the explanatory text that envelops the whole program. Macros are not the same as "section names" in standard documentation. Literate programming macros can hide any chunk of code behind themselves, and be used inside any low-level machine language operators, often inside logical operators such as "if", "while" or "case". This is illustrated by the following snippet of the wc literate program. In fact, macros can stand for any arbitrary chunk of code or other macros, and are thus more general than top-down or bottom-up "chunking", or than subsectioning. Knuth says that when he realized this, he began to think of a program as a web of various parts. In a noweb literate program besides the free order of their exposition, the chunks behind macros, once introduced with "<<...>>=", can be grown later in any place in the file by simply writing "<<name of the chunk>>=" and adding more content to it, as the following snippet illustrates ("plus" is added by the document formatter for readability, and is not in the code). The grand totals must be initialized to zero at the beginning of the program. The documentation for a literate program is produced as part of writing the program. Instead of comments provided as side notes to source code a literate program contains the explanation of concepts on each level, with lower level concepts deferred to their appropriate place, which allows for better communication of thought. The snippets of the literate wc above show how an explanation of the program and its source code are interwoven. Such exposition of ideas creates the flow of thought that is like a literary work. Knuth wrote a "novel" which explains the code of the interactive fiction game Colossal Cave Adventure. The first published literate programming environment was WEB, introduced by Donald Knuth in 1981 for his TeX typesetting system; it uses Pascal as its underlying programming language and TeX for typesetting of the documentation. The complete commented TeX source code was published in Knuth's TeX: The program, volume B of his 5-volume Computers and Typesetting. Knuth had privately used a literate programming system called DOC as early as 1979. He was inspired by the ideas of Pierre-Arnoul de Marneffe. The free CWEB, written by Knuth and Silvio Levy, is WEB adapted for C and C++, runs on most operating systems and can produce TeX and PDF documentation. Axiom, which is evolved from scratchpad, a computer algebra system developed by IBM. It is now being developed by Tim Daly, one of the developers of scratchpad, Axiom is totally written as a literate program. noweb is independent of the programming language of the source code. It is well known for its simplicity, given the need of using only two text markup conventions and two tool invocations, and it allows for text formatting in HTML rather than going through the TeX system. Literate is a "modern literate programming system." Like noweb, it works with any programming language, but it produces pretty-printed and syntax-highlighted HTML, and it tries to retain all the advantages of CWEB, including output formatted like CWEB. Other notable advantages compared with older tools include being based on Markdown and generating well-formatted "tangled" code. https://github.com/zyedidia/Literate. pyWeb is a literate programming tool that has syntax for macros similar to CWEB, but uses ReStructuredText instead of TeX for markup and respects indentation which makes usable for the languages like Python, though you can use it for any programming language. Molly is an LP tool written in Perl, which aims to modernize and scale it with "folding HTML" and "virtual views" on code. It uses "noweb" markup for the literate source files. https://github.com/unixtechie/Literate-Molly. The Leo text editor is an outlining editor which supports optional noweb and CWEB markup. The author of Leo mixes two different approaches: first, Leo is an outlining editor, which helps with management of large texts; second, Leo incorporates some of the ideas of literate programming, which in its pure form (i.e., the way it is used by Knuth Web tool or tools like "noweb") is possible only with some degree of inventiveness and the use of the editor in a way not exactly envisioned by its author (in modified @root nodes). However, this and other extensions (@file nodes) make outline programming and text management successful and easy and in some ways similar to literate programming. The Haskell programming language has native support for semi-literate programming. The compiler/interpreter supports two file name extensions: .hs and .lhs; the latter stands for literate Haskell. The code can be also marked in the Richard Bird style, starting each line with a greater than symbol and a space, preceding and ending the piece of code with blank lines. Although the package does not provide means to organize chunks of code, one can split the LaTeX source code in different files. See listings manual for an overview. The Web 68 Literate Programming system used Algol 68 as the underlying programming language, although there was nothing in the pre-processor 'tang' to force the use of that language. Emacs org-mode for literate programming through Babel, which allows embedding blocks of source code from multiple programming languages within a single text document. Blocks of code can share data with each other, display images inline, or be parsed into pure source code using the noweb reference syntax. CoffeeScript supports a "literate" mode, which enables programs to be compiled from a source document written in Markdown with indented blocks of code. Wolfram notebooks are a platform-agnostic literate programming method that combines text and graphics with live code.. Swift (programming language), created by Apple Inc. can be edited in Playgrounds which provide an interactive programming environment that evaluates each statement and displays live results as the code is edited. Playgrounds also allow the user to add Markup language along with the code that provide headers, inline formatting and images. Jupyter Notebook, formerly IPython Notebook - works in the format of notebooks, which combine headings, text (including LaTeX), plots, etc. with the written code. Julia (programming language) supports the iJulia mode of development which was inspired by iPython. Agda (programming language) supports a limited form of literate programming out of the box. Eve programming language programs are primarily prose. Eve combines variants of Datalog and Markdown with a live graphical development environment. Similar to Jupyter Notebooks, R Notebooks are a method of literate programming that allows for direct interaction with R (support for Python, SQL, and Bash are also explicitly named) while producing a reproducible document with publication-quality output. The customization mechanism of the Text Encoding Initiative which enables the constraining, modification, or extension of the TEI scheme enables users to mix prose documentation with fragments of schema specification in their One Document Does-it-all format. From this prose documentation, schemas, and processing model pipelines can be generated and Knuth's Literate Programming paradigm is cited as the inspiration for this way of working. ^ a b c v w x y z Knuth, Donald E. (1984). "Literate Programming" (PDF). The Computer Journal. British Computer Society. 27 (2): 97–111. doi:10.1093/comjnl/27.2.97. Retrieved January 4, 2009. ^ a b Knuth, Donald E.; Binstock, Andrew (April 25, 2008). "Interview with Donald Knuth". Retrieved January 4, 2009. Yet to me, literate programming is certainly the most important thing that came out of the TeX project. Not only has it enabled me to write and maintain programs faster and more reliably than ever before, and been one of my greatest sources of joy since the 1980s-it has actually been indispensable at times. Some of my major programs, such as the MMIX meta-simulator, could not have been written with any other methodology that I've ever heard of. The complexity was simply too daunting for my limited brain to handle; without literate programming, the whole enterprise would have flopped miserably. ... Literate programming is what you need to rise above the ordinary level of achievement. Another surprising thing that I learned while using WEB was that traditional programming languages had been causing me to write inferior programs, although I hadn't realized what I was doing. My original idea was that WEB would be merely a tool for documentation, but I actually found that my WEB programs were better than the programs I had been writing in other languages. Thus the WEB language allows a person to express programs in a "stream of consciousness" order. TANGLE is able to scramble everything up into the arrangement that a PASCAL compiler demands. This feature of WEB is perhaps its greatest asset; it makes a WEB-written program much more readable than the same program written purely in PASCAL, even if the latter program is well commented. And the fact that there's no need to be hung up on the question of top-down versus bottom-up, since a programmer can now view a large program as a web, to be explored in a psychologically correct order is perhaps the greatest lesson I have learned from my recent experiences. ^ ""Oral History of Donald Knuth"- an Interview with Ed Feigenbaum" (PDF). archive.computerhistory.org. Retrieved 2018-12-07. ^ a b Dominus, Mark-Jason (March 20, 2000). "POD is not Literate Programming". Perl.com. Archived from the original on January 2, 2009. I chose the name WEB partly because it was one of the few three-letter words of English that hadn't already been applied to computers. But as time went on, I've become extremely pleased with the name, because I think that a complex piece of software is, indeed, best regarded as a web that has been delicately pieced together from simple materials. We understand a complicated system by understanding its simple parts, and by understanding the simple relations between those parts and their immediate neighbors. If we express a program as a web of ideas, we can emphasize its structural properties in a natural and satisfying way. ^ a b c d Ramsey, Norman (May 13, 2008). "An Example of noweb". Retrieved January 4, 2009. ^ The game, also known as ADVENT, was originally written by Crowther in about 700 lines of FORTRAN code; Knuth recast it into the WEB idiom. It is available at literateprogramming.com or on Knuth's website Archived 2008-08-20 at the Wayback Machine. ^ de Marneffe, Pierre Arnoul (December 1973). "Holon Programming – Report PMAR 73-23". University de Liège, Service d'Informatique. ^ Ream, Edward K. (September 2, 2008). "Leo's Home Page". Retrieved April 3, 2015. ^ Sian Mountbatten. "Web 68: Literate programming with Algol 68". Retrieved 1 January 2013. ^ Jeremy Ashkenas. "Literate CoffeeScript". Retrieved 13 November 2014. ^ Milestones in Computer Science and Information Technology by Edwin D. Reilly, p. 157. ^ "Wolfram Notebooks". www.wolfram.com. Retrieved 2018-11-28. ^ "Markup Formatting Reference: Markup Overview". developer.apple.com. Retrieved 2015-11-15. ^ "Literate Agda". Agda Wiki. Retrieved 2017-03-26. ^ "Eve and Literate Progamming". Eve Handbook. Retrieved 2017-05-25. ^ "TEI Guidelines". TEI Consortium. Retrieved 2018-08-23. Sewell, Wayne (1989). "Weaving a Program: Literate Programming in WEB". Van Nostrand Reinhold. ISBN 0-442-31946-0. Knuth, Donald E. (1992). Literate Programming. California: Stanford University Center for the Study of Language and Information. ISBN 978-0-937073-80-3. Nørmark, Kurt (August 13, 1998). "Literate Programming – Issues and Problems". University of Aalborg. Schulte, Eric (January 2012). "A Multi-Language Computing Environment for Literate Programming and Reproducible Research" (PDF). 46 (3). Journal of Statistical Software.